Look at these ladies getting strong! This is for people who have some chronic or difficult to resolve bodily complaints: low back pain, neck issues, slouchy posture, pelvic floor issues, headache, etc., and want to be able to care for themselves at home in between treatments. This class is limited to 12 people so everyone gets personalized attention. Babies are welcome, children, too, if they are mellow and not disruptive. If you want to sign up, please do so soon. It will fill up. Please click the . Payment due when class starts. Thank you. Calling all achy shoulders, stiff spines, knotty necks, fussy low backs, tweaky hips, ouchy feet, creaky jaws come get tuned up in Dr. J’s Repair Shop. We will learn to love the foam roller, therabands and develop a new relationship with your core and pelvic floor. Take your healing to a new level. If you’ve ever asked, “But what can I do at home to help with …..?” then this class is for you. Let’s play. Next series starting soon. Stay tuned! This class is designed to help get your body into shape either while pregnant or post partum. The focus will be on strengthening the muscles you need to support you during your perinatal phase. Strong arms and shoulders as well as low back and pelvic stability are key to make sure your body adapts to the stresses of pregnancy. We will be addressing pelvic floor and how to balance it so it works fluidly: responding to the demands placed upon it without being too tight or too loose. Pelvic floor health is a MUST during this phase. Posture is very important as well. We will do exercises to get your rounded shoulders rolled back to neutral, reduce anterior head carriage (forward head posture) and help balance the pelvis while the center of gravity (your belly) is changing. Prepare to stretch those tight muscles and strengthen the weaker ones so you can be and feel your best. Feel free to come with your baby and/or older children if they can be not too disruptive, etc. If you want to sign up, please do so soon. It will fill up. Click the button and sign up. Payment due when class starts. Thank you. This 3-week mini series shares the art and magic of baby massage as a way for you to deepen your bond with your child and provide you with deeper connection. You will learn surprising clues to communicate with your wee one, understand movements as communication, feel the energy of discontent and how to relieve it, and learn ways to help induce sleep, ease fussiness, and guide digestion. 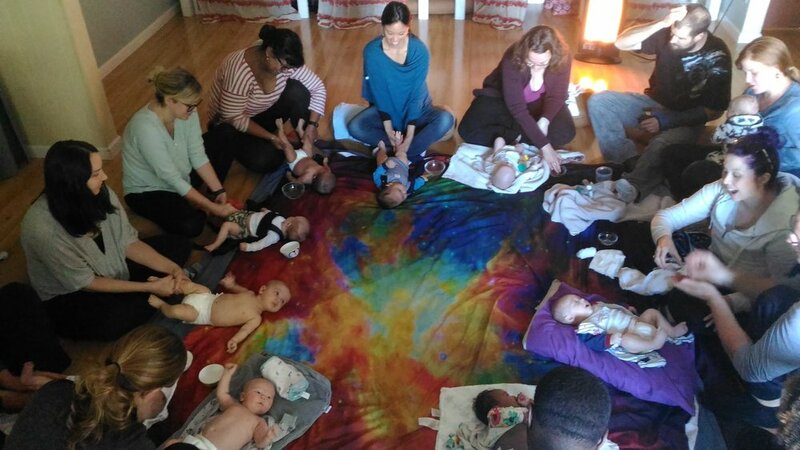 This is a time to connect, share magic together, and get trained to be a baby whisperer. 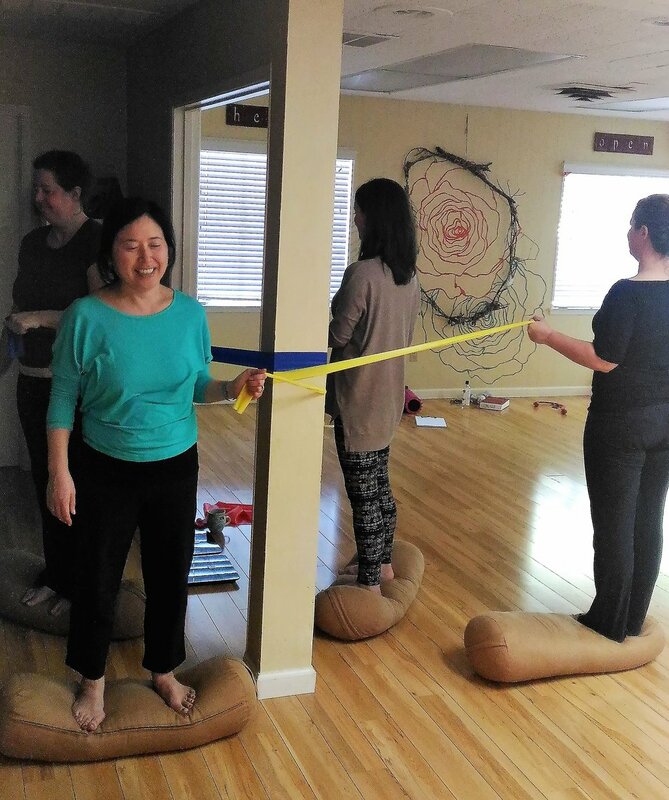 The class creates a mellow environment and will take place on a communal warmed blanket on the floor with bolsters for parents. We also cover some reflexology points to help with teething, ear pain, abdominal discomfort, constipation, fussiness and general wellness. This class is such a wonderful experience. Being with babies and parents loving on them is truly soul-satisfying.